Balanced shade, dappled sunlight and tree canopy views are the basis of this house design. In the center courtyard grows a live oak tree and each interior space has a unique relationship to this central element. In plan, the home is organized into clear zones of public and private function, allowing the center courtyard and preserved tree to negotiate the connection between either realm. “The layout is arranged to optimize function and experience, where each daily behavior is considered in connection with the next, resulting in a holistic and flowing composition, rather than just a collection of rooms.” explains Matt Fajkus, principal architect at Matt Fajkus Architecture. The courtyard serves as a natural amphitheater for gatherings within the wings of the house. Rather than corridors, the circulation space is intended for passage and informal activities. A two-story “window wall” frame various views to the courtyard and harvest daylight to the entry zone. The Aluminum Series windows and sliding patio doors, which are long and skinny, were selected and placed to fit within the stud spacing in an efficient manner and to coordinate with the linearity of the scheme. “The entry zone with the Aluminum Series window wall is particularly interesting to us since it directly relates to the oak tree in its verticality and the way that it dapples daylight into the space much like a tree modulates light to create dynamic shade below,” said Fajkus. The master suite opens to the small yard. The tongue-and-groove wood ceiling is an accent which continues to the exterior soffit, bridging the outdoors and indoors. The design optimizes view and perceptual depth of interior space and also makes a more meaningful connection to the site and context. 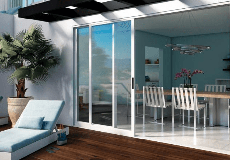 For more information about our Aluminum Series Windows and Patio Doors, click here.